Everyone knows Pixar movies are literally the best movies ever made, which makes today’s news especially gut-wrenching: A bleary-eyed group of Pixar executives have announced that they have no idea what kinds of antics would happen if furniture could talk. Yikes. This is absolutely tragic. The heartbreaking announcement came at a press conference earlier today when a handful of overtired Pixar executives revealed that after years of failed ideas and dead ends, they will never figure out what sort of adventures a piece of furniture might get itself into. Leaders of the 3D-animation company stated that no matter how they thought about it, they have no clue whether a bookshelf and a chair would be best friends whose quest to find their parents teaches us about love, or sworn enemies who are forced to put aside their differences and work together to stop an evil cabinet from taking over the world. 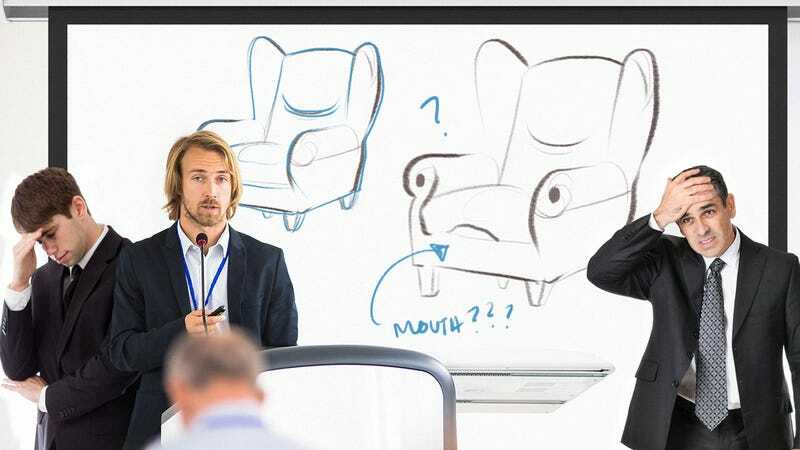 According to their statement, the group began storyboarding a movie about the furniture world as soon as the company was founded in 1986, but they spent the first few years unable to proceed beyond a drawing of a couch with the space between the cushion and the frame labeled “mouth.” Eventually they realized that if they gave the couch legs it’d be able to move around, but where it would walk to has unfortunately stumped them to this day. Wow. This is definitely crushing news for Pixar fans. While there are no plans for the company to keep trying to crack a furniture movie, here’s hoping that one day it’ll realize which piece of furniture is the protagonist, and a movie plot will fall into place.